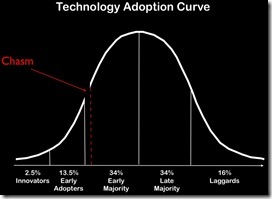 Panlibus Blog » Blog Archive » Can RFID get it together to jump the chasm? Can RFID get it together to jump the chasm? After what seems an age of working from home and in the office over the summer, I’m out on the road again. This post is coming from the departure lounge of the airport serving the wonderful city of Glasgow. I’m on my way back from speaking at a one day conference – Introducing RFID – Are you on the right wavelength? – jointly organised by JISC and the Scottish Library & Information Council. RFID that wonderful technology that makes self-service so much more an engaging and simple process for library users, has been around for many years. Yet for many libraries it is still new technology to be concerned about, not least because of the substantial financial and time investment required to deploy it. It is telling of where we are with the general take up of this technology that almost without exception every speaker [including yours truly] felt the need to provide the audience with their description of what RFID is and the potential future benefits that may come from adopting it. The best simple description of what RFID is today came from JISC’s Gaynor Backhouse – RFID is barcodes on steroids. A way of attaching a machine readable identity to a physical item, that is easier to handle than a barcode and also can act as an overt security device. Being able to read multiple items, without the need for contact or direct line of sight, has revolutionised the self-issue & return processes; finally realising the benefits for library staff and customers that were banded about many years ago when self-issue was first promoted. Many of the speakers also emphasised the extra benefits for staff, undertaking mind-numbing labour intensive tasks such as stock taking/weeding/finding/checking, with the introduction of RFID reading wands and smart shelving. There was much agreement as to these benefits, which are available to all libraries. There were a few mutterings about interoperability issues between the offerings from different RFID system suppliers, but I get the impression that these concerns are rapidly fading. Where there was far less clarity and agreement was the future of RFID beyond being just a better barcode. An RFID chip is not only capable of storing far more data than just an identifier, but also it has the capability for that data to be changed and added to. As a techie at heart, the prospect of having the equivalent of a radio accessed memory stick stuck to every book cover, gets my creative juices running: the item’s loan history could follow it around; the book could arrive from the publisher with it’s catalogue record on board; it could attract the attention of an RFID enabled phone to tell it’s owner that is overdue and needs taking back to the library – to mention just a few of the more sensible ones. There is a major blockage to the adoption of what could be described as these RFID 2.0 visions. Nobody can agree on how to store the data on the RFID chips – as of today there is no standard for this. In the standards less vacuum each supplier is doing their own incompatible thing. That is not to say that there are no standards for RFID. As independent RFID consultant Mick Fortune testified, there are more standards in this area than is wise to display on a single PowerPoint slide, but none of them address the issue of how to store this extended book/library data. 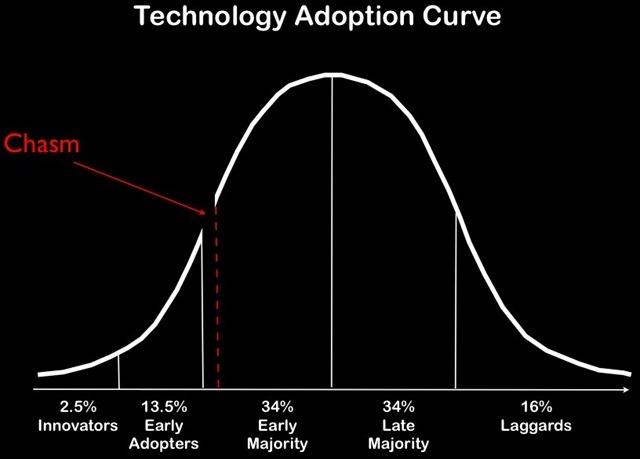 For a technology to become generally adopted, crossing that chasm between the early adopters to the take up by the early majority of users, there needs to be a standardised market in operation, reducing costs and risks. Would the CD have been widely adopted if each record label, or equipment manufacturer, used their own proprietary encoding format? Mick Fortune went on to describe some light on the horizon in the form of a proposed standard – ISO 28560-1 – a standard which codifies 25 data elements. The adoption of this would be a major step forward. Unfortunately, as always it seems in the world of standards, ISO 28560-1 is not the whole story. There are also two competing, and apparently mutually exclusive, standards ISO 28560-2 & ISO 28560-3 which describe how these elements would be encoded on a chip – that’s the trouble with standards, there are so many to choose from!. If these standards are agreed, ratified and adopted by the industry I believe we will have removed a substantial barrier to the wider use of RFID for things beyond barcode replacement. The next problem will be to gain some agreement as to what those uses might be. I may be short sighted but from my current point of view RFID 2.0 (I know I’m going to regret calling it that) looks like a great solution searching for a problem to solve. 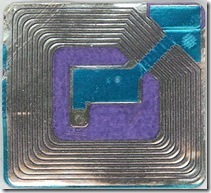 RFID 2.0.. Have you just created another management buzz word. I’m not sure the world needs another one of those. Having just implemented RFID using Tags from one vendor, and self service units from another, we here at UCLAN are very aware of the issues regarding differing standards. Though worrying at first, we found that the various verndors were easily able to accomodate each others tag data formats. Whilst there is no standard, companies must show flexibility in order to win contracts. It’s great to see RFID usage and adoption from the library perspective. It’s true, there are several standards out there and that’s always a barrier to widespread use of a newer technology. Fortunately the RFID reader manufacturers are widening their product offerings to work with the different standards. I think that as large RFID users (government and large industries) continue to turn to RFID, clearer standards will emerge because of their demand. Current usage of RFID in libraries tends to store only an identifier on the RFID tag. This avoids the need to update information on the tag in the future (which would generally be a pain – you wouldn’t want your catalogue and tag getting out of sync). Similarly I’m not sure that storing due dates on the chip would be wise – all of this is in the LMS, and there seems little benefit in storing on the tag. I’m also not sure that the standards issue is quite as big an issue as seems to be suggested here. There are many different ‘barcode’ encoding systems, but as long as you have multiple suppliers of both the tags and the readers, then I don’t think having a single standard we all agree on isn’t necessary for a health, future-proofed market. I do think there are definite benefits to looking at how RFID can have a positive impact on the library supply chain, and how information moves along it. My vision is getting a box of books, scanning it, and all appear as ‘received’ on your LMS. Combine this with delivered bib records (retrieved online via a shared identifier – why bother putting in on the chip? ), and EDI Invoicing, this could substantially cut down time spent manually ‘processing’ books. Of course, you’d need quality control of somekind, but definitely some potential here, and so far seemingly unexplored by vendors and libraries. Apart from the ‘scan all the books inside a box that has just been delivered’ bit that RFID could probably help with (I understand from the conference that there are still some problems with scanning more than a few chips in close proximity to each other), what you describe is already possible. The Talis Gateway service, plus finance integration, combines EDI ordering (from the supplier selection phase), delivery of shelf-ready stock (scan and it’s on the shelf), auto insertion of bibliographic and individual item records in to the LMS, EDI invoicing, and the final step integration with your institutional finance system. All this potentially without any manual processes other than unpacking the book and scanning it as you put it on the shelf. Also by the way it is a managed service with over 40 EDI suppliers, so that you don’t even need to worry about the technical wrinkles that often creep in to EDI service management. I agree that RFID could speed that up a little – but not much. On the other points you raise as to the benefits of putting extra data on the chip, as I said in the post I think it looks like a great solution searching for a problem to solve. Rather belatedly discovered this blog by an act of supreme vanity – looking for my own name. RFID seems a much maligned and misunderstood technology – not unlike twitter – but unlike twitter it’s likely to be damaging if not handled wisely. The point of a data model standard is twofold. Firstly, the assertion that “current usage of RFID in libraries tends to store only an identifier on the RFID tag” is sadly no longer true. Aprt from the debate over AFI vs EAS security – which lies outside the data model – libraries themselves, perhaps prompted by suppliers, have been encouraged to think of new and exciting data that could be stored on tags – and are doing it. A brief look at the RFID list will reveal that systems librarians are eager to play with this new “gadget”. At least two of the major RFID suppliers in the UK recommend as a matter of course that bibliographic information be stored on the tags as well. I was recently taken to task by an former colleague and system designer for NOT advocating the inclusion of as much data as could be fitted onto a tag. Many tenders from libraries ask for tags with much greater capacity than required to accommodate ISO 28560. Secondly there are currently no systems in the UK market that read and “auto-discriminate” between RFID tags in the way that they do with barcodes. Plus the tags are NOT the same. Put those two facts together and the second of Owen’s assertions “as long as you have multiple suppliers of both the tags and the readers, then I don’t think having a single standard we all agree on isn’t (sic) necessary for a health(y), future-proofed market” holds true either. These are not barcodes, they are very small data stores. If we all use them differently – and develop bespoke solutions with our chosen LMS supplier to utilise the data we’ve chosen to store – we may find each library stranded at the end of a cul-de-sac of its own making. Having said that – and as I said in Glasgow, in the Gazette, in London and everywhere I can think of – I think we should explore what new possibilities might exist for exploiting the technology to deliver new services. Offline circulation is one. Automated accessioning is another – and in fact I raised that possibility with Dave Errington last autumn because I was already aware of the Talis service from my EDI involvement at Nielsen. If we stand back and do nothing I have no doubt that RFID has the potential to fragment our library services to a point from which they cannot recover. Whilst we build a new world online we risk losing touch with the heritage on our shelves. At the moment RFID actively PREVENTS the kind of co-operation they will need to survive. With common data standards they will at least be able to share stock, buy from different suppliers and have some optimism about future proofing an expensive investment. Vanity apart it is good to hear your thoughts on this Mick. I agree standardisation on identifiers and encoding on chips would be a major leap forward enabling disimilar systems from different suppliers to recognise what the hing attached to the chip is and, in the case of library stock, where it came from. In this increasingly online interconnected world I still remain to be convinced what significant extra benifits holding things like bibliographic data on chip would achieve. Owen highlighted the obvious synchroniastion issues around this. As yo describe RFID systems/suppliers/uses should grasp the oportunity to standardise the way IDs are associated with items and are read easilly, but beyond that I still feel they are a great gadget/solution looking for a problem to solve. Oh! Amen to the bib data issue. I’ve just written a piece for Nielden saying NOOO – don’t go there! And Owen has that point entirely right. Have been speaking to BDS about the same issue. HOWEVER. What I, and no-one else, can do is legislate against insanity, and it seems to me that agreeing a common data standard is one way to reduce the risk that libraries will build their own little “Towers of Babel” (see CILIP Buyers Guide article) – sorry to mention CILIP btw :-). Just because it’s obviously wrong to get database and tag out of step doesn’t mean libraries won’t try it! I think this is only really a problem for the public library service. Academic librarians -as someone said recently – still have respect and knowledge. Public library systems librarians are an endangered species and as susceptible to being sold snake oil as they ever were. Most academic librarians react in the same way as you and Owen have. It’s obvious ennit? But it’s not like that in the public library market at all. Your belief in the grasp that RFID suppliers have of the way in which databases and systems work is rather touching. I could identify at least one major supplier who routinely tells clients that supportiing different tag formats is just a line in the “win.ini” file and that the data model written on the tags is called SIP! If you’re being advised by salesmen with that level of ignorance what chance have you got? So knowing that most of the arguments around the use of RFID for data storage are spurious doesn’t prevent them from being potentially damaging. I know that, you know that, Owen knows that. Sadly an ever increasing number of libraries are finding that out the hard way. But we still need to talk. Good grief! Just re-read that 2nd paragraph again! What it was meant to say was that no-one – INCLUDING me – can legislate against insanity. Not the way it reads. I’m not THAT pompous!